A Beechcraft King Air 350 takeoff on runway 25 at Eagle County Regional Airport (EGE), Colorado. Also known as the Eagle/Vail airport it’s ranked number eight on the History Channel’s show Most Extreme Airports. The factors that placed Eagle on this list are a higher elevation of 6,540 feet, steeply rising mountainous terrain on all sides, downhill sloping runway, unpredictable weather and challenging approach and departure procedures. All of these factors make Eagle a very challenging airport for both experienced and novice aviators. On a cold clear day Eagle is a joy to fly into, the sweeping mountain vistas are breathtaking. Unfortunately, add a little weather or loose an engine on a hot day and this airport is suddenly not the fun lunch stop you planned on. Due to the mountains the approaches have what at first seem like fairly high minimums of 3 miles and 1,790 feet. But don’t forget if a snow squall suddenly blooms over the mountain, the runway can disappear in an instant. Ask yourself what if I lose an engine after doing a missed approach or on the departure procedure. 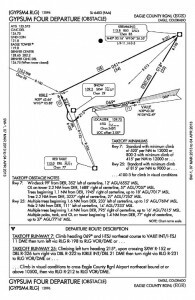 Can my aircraft maintain the required 13% climb gradient required to climb to a safe altitude. Mountain flying can be greatly rewarding, just be sure you check your aircraft’s single engine climb performance or get some instruction in mountain flying before flying into your first mountain airport. This entry was posted in Uncategorized and tagged airplane takeoff, beech 350, eagle airport, eagle colorado, eagle county regional airport, eagle/vail airport, ege, ifr departure procedure, king air 350, king air takeoff, kingair 350, mountain flying, takeoff, turboprop on March 28, 2013 by James Sorsby.